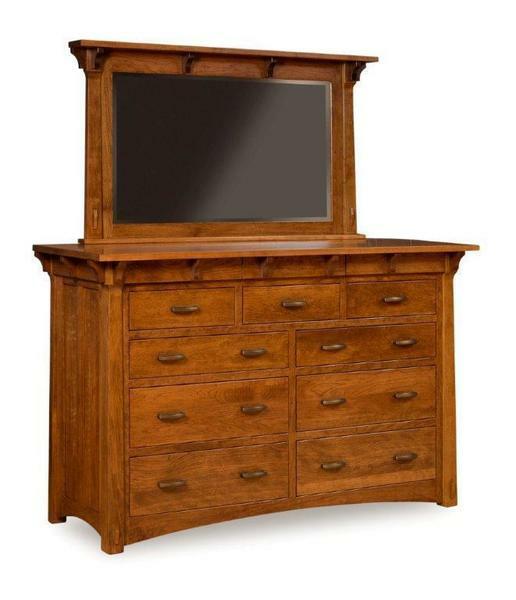 This stately dresser is Amish handcrafted in a popular Arts and Crafts style. This Mission dresser has nine roomy drawers offering plenty of storage space for all your clothes. You can choose to order the beautiful mirror shown in the photo. You also have the option of adding hidden drawers. This dresser is shown in cherry wood but also available in rustic cherry, oak, brown maple and quarter sawn white oak wood. Featuring corbels, decorative tenons, solid wood reverse panel sides, 1" top and tapered feet make this a truly unique Mission dresser. We also offer a Manitoba Mission Dresser with Seven Drawers if you are looking for a bit of a smaller dresser.